attorney client privilege « Hercules and the umpire. A petard is not what you think it is. Well, to be more accurate, a petard is not what I thought it was. 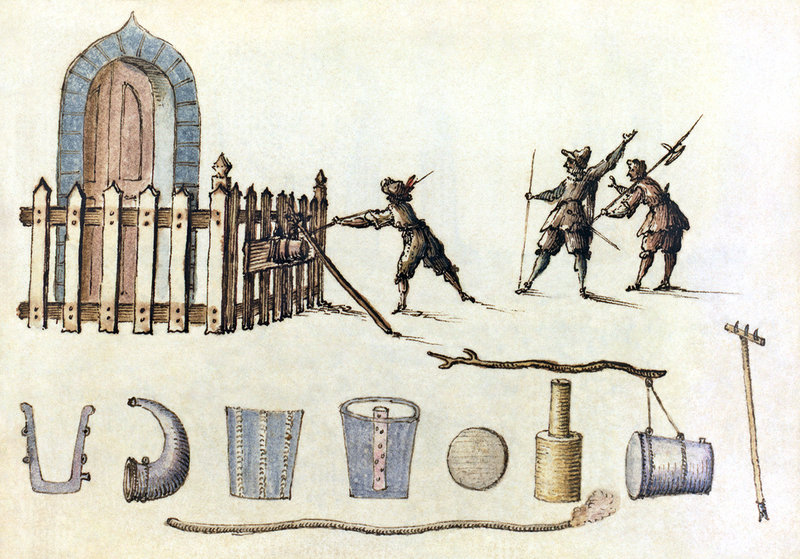 A petard is a small explosive device used to breach gates and the like as shown in the sketch reproduced above. The meaning of the word “petard” derives from taking the roots of the word in Middle French, Latin and Greek and making an analogy. That is, the small explosive character of the bomb is the equivalent of breaking intestinal wind. The phrase “hoisted by your own petard,” as used in Hamlet, means that one has blown oneself up. Hey, pay attention now, this is not a digression! A year or so after Judge Ross dissented in Jones v. Clinton, I had my own run in with the Clinton whirlwind. Few people know it, but the First Lady is a government official for purposes of the attorney-client privilege. If you think about it, that makes sense. Anyway, Mrs. Clinton discovered some papers in the residence at the Whitehouse. Mrs. Clinton had a meeting with her personal lawyer and her White House counsel to decide what to do with the papers. They decided that the papers should be turned over to Kenneth Starr, the special prosecutor. That was not good enough for Starr, and he obtained a grand jury subpoena to get the lawyers’ notes of that meeting. Susan Webber Wright, the district judge, who is a really nice person and a great judge, said hell no. And that important matter of first impression came to the 8th Circuit, where I was sitting by designation. The case is In Re Grand Jury Subpoena, 112 F.3d 910 (8th Cir.) (holding that the White House may not use the attorney-client privilege to avoid complying with the subpoena issued by a federal grand jury calling for lawyers’ notes and Mrs. Clinton’s reasonable belief that her conversations with White House lawyers were privileged was insufficient to prevent their disclosure), cert. denied, 117 S.Ct. 2482 (1997). Judge Bowman wrote the opinion for the court and Judge Wollman agreed. I dissented. I vividly remember the oral arguments because they took place in a sealed courtroom in St. Louis. The proceedings were closed because the matter dealt with a grand jury matter. Anyway, as I saw it, the question was whether or not the White House had an attorney client privilege in a criminal case and whether Mrs. Clinton gave up her personal privilege by participating in a meeting with White House counsel. (1) The special prosecutor must make an initial threshold showing before the district court that the documents are: (a) specifically needed; (b) relevant; and (c) admissible [or would lead to the discovery of admissible evidence]. (2) Assuming such a showing has been made, the documents are first delivered to the district judge, who will examine the documents in chambers, to decide if in fact the documents are relevant and admissible, and irrelevant documents will be returned under seal to the White House. I also reasoned that Mrs. Clinton did not forfeit her personal privilege because she had reasonably relied upon the existence of the governmental privilege in a matter of “common interest.” But, in the future, Mrs. Clinton could have no personal privilege under similar circumstances because under the Nixon balancing test the governmental privilege could be overcome in a criminal case in certain rare circumstances and thus she could not thereafter reasonably rely on the “common interest” proviso. After the opinion was unsealed at the request of all parties and the matter hit the press, most everyone assumed the Supreme Court would take the case. After all, it was a matter of first impression and it involved the scope of the White House’s attorney-client privilege. But, as frequently happens, the Court fooled everyone. It let Judge Bowman’s opinion stand. Shortly thereafter Judge Ross called me. Our conversation was brief. He said simply, “Richard, my boy, we have been hoisted by our own petards.” And that was that. P.S. To be perfectly clear, I do not mean to suggest in any way that Judge Bowman or Judge Wollman were motivated by politics. Moreover, as a district judge sitting by designation on an explosive case like the one mentioned, Judges Bowman and Wollman could not have been nicer or more helpful and that was so despite my dissent. They are true gentlemen.